Little children crouched on the floor, some clamping their mouth in fear, as a mob protesting against the film "Padmaavat" threw rocks at their school bus in Gurgaon near Delhi on Wednesday afternoon. "There were policemen, but no one was listening to them. The mob didn't care... We covered all the children and made them sit on the floor," said a teacher. Delhi Chief Minister Arvind Kejriwal blamed the Haryana government for their inaction. "Utterly shameful. More disgusting is the complicity of those governments who are allowing it through their inaction," he tweeted. 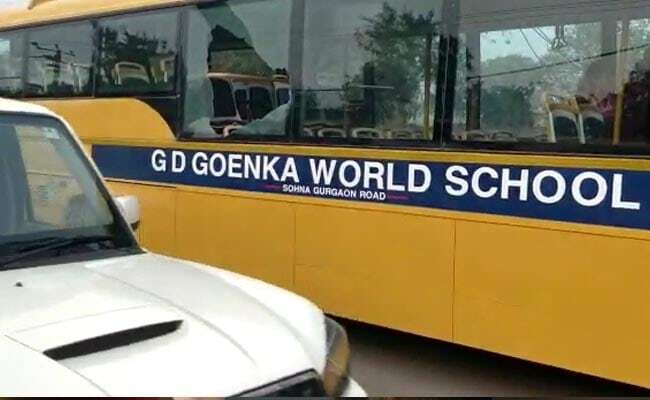 Some schools in Gurgaon have announced that they will be closed on Thursday. Gurgaon Police Commission Sandeep Khirwar told NDTV that strict action will be taken against those involved in the violence. "This is a very condemnable incident. We have brought some culprits to book. Will take stringent action against them," he said. "Padmaavat" is set for release today but groups like Karni Sena have vowed to block the film at all costs, in defiance of Supreme Court orders. The protesters insist that the film twists the story of 14th century Rajput Queen Padmini, who preferred to jump into a fire to surrendering to Delhi Sultan Alauddin Khilji. Violence and arson has been reported from parts of Haryana, Gujarat, Rajasthan and Uttar Pradesh -- the states that had initially banned the movie despite the censor board allowing it with tweaks. The Supreme Court on Tuesday rejected Rajasthan and Madhya Pradesh's final attempt to ban the film on grounds of potential violence. The court said banning a film violated creative freedom. "Padmaavat" stars Deepika Padukone as Queen Padmini, Shahid Kapoor as Maharawal Ratan Singh, the husband of Padmavati, and Ranveer Singh as Alauddin Khilji who leads an invasion to try to capture the queen.